S-100 boxes and card cages come in many sizes and shapes. The IMSAI box is a classic of the early designs. However these systems fail at high CPU bus speeds because of third simple motherboards. 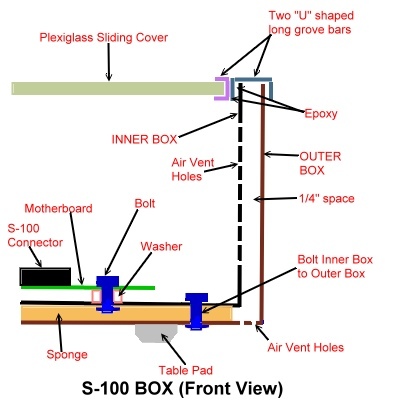 I decide to make my own S-100 box. The first question I had was how big a box do I want the final computer to be in? Did I want to include hard disks, floppy drives (8" and/or 5" drives) and their power supplies. After a long decision I decided on a smaller box for the S-100 card cage its power supply and room for one hard drive. This would be the basic functional system. To load and save software a separate box with its own power supply would contain two 8" floppy drives, one or more 5" drives and later if needed (see here), further hard disks (probably modern IDE interfaced drives). I wanted go with a standard metal box structure so in the end decided on a 7" high, 17" wide, 32" deep aluminum box. I obtained this box from Mouser Electronics. You might also consider the more standard 19" wide boxes as this as I later noticed will allow you to place the hard disk flat beside the S-100 card cage instead of on it's side as we shall see in my case. As we shall see we will only be using the sides and bottom of this box since we will have to have very fancy front and back panels custom cut (see below). My main reason for the smaller tight box dimensions was that I wanted it to take up as little space as possible on my main office desk. The box was all aluminum with many holes and bolts showing as I attached the motherboard and power supply. In spite of searching a lot I could not find a 22 slot S-100 card cage on the web and elsewhere. I did come across a Northstar box and card cage on eBay but it was too small for my long Godbout 22 slot motherboard (see below). In the end I decided to make my own card cage out of common " L" shaped rods of aluminum cut and assembled to support the card guides as shown above. The card guides are attached to the frame by drilling holes and popping the card guides in place. It's important to make sure they are exactly aligned with the S-100 edge socket otherwise the card will not be vertical and make a reliable connection with the bus. These card guides I obtained years ago from a surplus electronics parts store. You can get them today from companies like Mouser. Make sure to get guides that do not use up too much of the boards real estate as some boards have components close to the edge of the board and so will not slide easily into the bus. If you are going to run your CPU at low speed (~2MHz) the type of motherboard is not too important. If you want to have a reliable high speed system (say ~5Mhz) you definitely will need a good motherboard. Many were made for S-100 computers. You can even I suppose make your own simply by connecting a number of 100 pin connectors available from companies like Mouser or DigiKey or Vector. I have had very good success with a 22 slot TEI Motherboard. The Godbout motherboard is very similar except that it has 20 S-100 slots instead of 21. This board is extremely well made with a thick backing, a well grounded back-plan and multiple attachments to attach the +8, +16 and -16 power lines along the length of the board. The board has electronics to minimize noise and cross talk on the address, data and control lines on the bus. The schematic for this circuitry is shown here. It is important to attach the motherboard properly to the above metal box/card cage. There are multiple attachment screw points under the board. make sure to utilize them all. You do not want the board flexing as you insert and remove S-100 boards. The figure shows the motherboard in place. Note the use of heavy power line wires. Many S-100 boards take well over 1 amp each to run. With 22 cards in place the 8V line can be running well over 25 amps. Heavy copper wiring is essential. Also to be on the safe side each line needs to be properly fused. I used 'pop-out' fuses since on more than one occasion I had a short. The S-100 bus is a little unusual in that unlike many other computer busses the power supply to the cards is distributed to voltage regulators on each card. There is no regulated +5 volts line for example. Whole books have been written on power supplies. 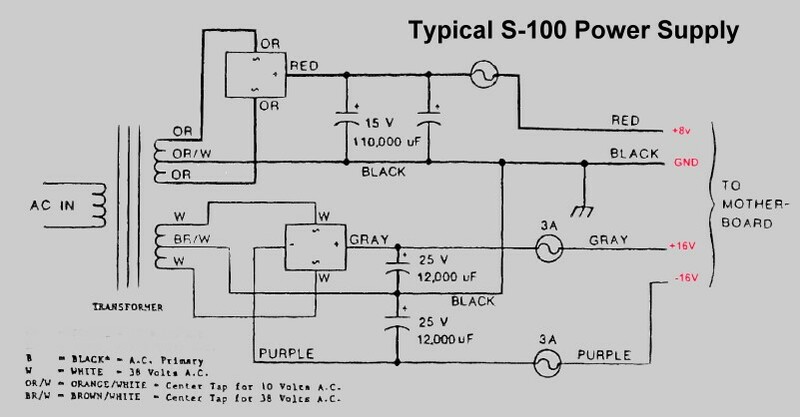 Fortunately for the S-100 bus the power supply can be relatively simple. What is needed is +8 volts on pins 1 and 51, +16 volts on pin 2 and -16 volts on pin 52. Here is a typical power supply schematic. The above are the desired voltages. Because each S-100 board has its own voltage regulator (or Zener diode), there is a wide tolerance as to voltage values that can be used on the bus. For the 8 volt lines for example, you can normally go down to about 7.5 volts or up to 10 volts -- although the regulators on the boards get quite hot at the latter values. Over voltage values on the +16 and -16 lines are typically more of a problem because many boards use a Zener diode with a lower power dropping resistor which can overheat. Also if the voltages on these lines are above specs check the voltage tolerances for the power lines filtering capacitors on each board. Recently I had an old Godbout memory board capacitor actually go on fire because the voltage was above the boards rating. 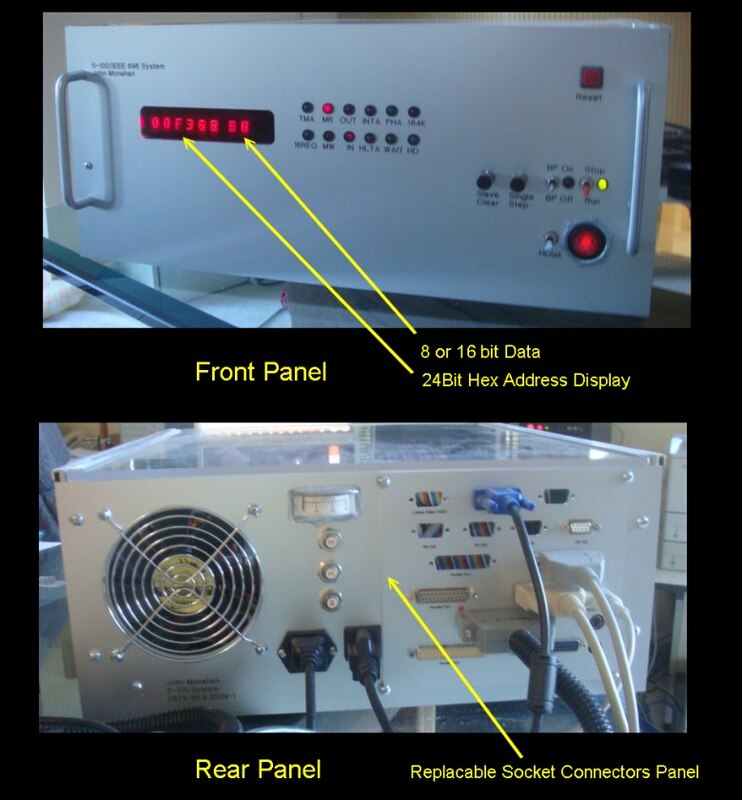 Today there are two basic power supply systems you can use for your S-100 computer system, "linear power supplies" and "switching power supplies". In the old days all S-100 systems used only linear power supplies. The above schematic is an example of such a supply. These typically consisted of one large transformer a series of diodes and a few large "can" type capacitates. Because each S-100 board could take 1-2 amps, typical supplies were capable of supplying 20 - 30 amps on the +8 volts line. The advantage was they were simple and cheap to build. However they were cumbersome and heavy. 30 Amp power supplies like this weight 10 or more pounds! I started off putting a linear power supply in my system. Apart from the large transformer, the diodes should be capable of handling initial current surges of 100+ Amps. Large metal can type of smoothening capacitors are required. Here are a few pictures. In the end I decided against using this setup for two reasons. First it took up too much room and second I was unhappy with the transformer output voltage for the +8 volt line. It ended up being about +10 volts. This would work, but the voltage regulators on the S-100 boards would run hot. I searched the usual web sources for a 20+ amp transformer that would supply +8 and +/- 16 voltages. I could not find a reasonable candidate. One way around this is to use a small common Japanese power supply converter that converts the US 110 volts AC to the 100 volts the have in Japan and use this output to feed the main power supply transformer. However this arrangement uses up still more real estate in my computer box. These are common these days. Every IBM-PC type computer in the world has one. Unfortunately these power supplies only put out +5, and +/- 12 Volts. We need higher voltages for the S-100 buss. Fortunately there are more specialized power supplies available to handle these voltages. I ended up going with a number of power supplies from a group called Mean Well available from many common suppliers, for example Mouser. For the S-100 8 volt line you can use either their 16A, 9V supply (S-150-9) and adjust it down to ~8.5 volts or use their 27A 7.5V supply (S-210-7.5) and adjust it up to ~8 volts. I find all the voltage regulators I have on my boards work fine with 7.5 Volts. They run cooler at this voltage too. Now since this supply is capable of delivering significant currents I wanted to have a safety net of 3 fuses on the 3 power lines. These are the resettable pop out fuses. I currently am using 20 amp fuses on the 8 Volt line and 3 Amp fuses on the 16 volt lines. The good news is we don't need large filtering capacitors any more. Mean Well also have a number of 15V (which are adjustable up 10%) for your +/- 16V lines. 3 Amps on each is usually more than enough. For the +/- 16V supply I use their T-60C, adjusting the 15V supply upwards. Mouser also supplies PSU's like these. Their TDK LS50-15 supplies +15Volts (only), at over 3 Amps. Their MeanWell RSP-200-7.5 can be adjusted up to 8 volts and can deliver 26 Amps! There are many other suppliers of these units all available on the web. Just for my own information I have a small 25 amp current meter in line on the 8 Volt. This is not really necessary, but it is nice to know how much current your computer is using with different configurations. By the way, some people have changed their S-100 system power supply to put out 5 volts on the 8 volt line and +/- 12 volts on the 16 volt lines and remove the voltage regulators on all cards. This does seem to work fine though it is a little bit of a pain when you collect S-100 Boards in that you have to modify each card. Also be absolutely sure you don't put these cards back into a standard +8 volt S-100 system. The advantage is you can utilize the above common IBM-PC type power supplies. Finally a word of caution. The 8 volt power supply line in these systems is capable of delivering considerable current. Its can be a mini arc welder -- be careful.